The Switchbacks kicked off their 2018 campaign with a 2-0 victory over LA Galaxy II at Weidner Field in front of 3,023 fans. Looking to start their season on the right note, the Switchbacks welcomed LA Galaxy II in their first ever season opener at home. The Switchbacks got off to a hot start, controlling possession and firing off a few shots but unable to find the back of the net. The Switchbacks nearly took the lead in the 9th minute, as Shane Malcolm played a perfect ball into the box but Saeed Robinson's first touch was just off. The Switchbacks finally took the lead in the 25th minute as Shane Malcolm played a ball to Aj Ajeakwa who fired a rock that bounced off the underside of the crossbar in a sure-fire "Goal of the Week" nominee. The sides would continue to battle as the Switchbacks took the 1-0 lead into the break. The Switchbacks doubled their lead in the 55th minute as Man of the Match, Jordan Burt, blasted home a penalty kick. After a small scuffle, Jordan Schweitzer (COS) and Hugo Arellano (LA) were issued yellow cards for dissent. The match picked up the intensity in addition to being a little chippy as two more yellow cards were issued in the second half. Despite a handful of chances of LA, Steward Ceus was relatively untested, needing only one save to keep his clean sheet. 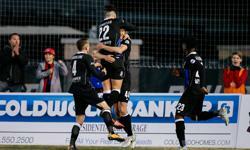 After three minutes of stoppage, the Switchbacks held on to take their shutout victory to open the 2018 USL campaign. "Overall, I thought it was a good match," said Head Coach Steve Trittschuh. "Going in, our goal was a shutout and we accomplished that today. Defensively we were fantastic. I think we're still a couple of weeks from where we need to be, but this gives us some good things to work on ahead of Portland next week. Overall, I can't really complain about anything." "That was the way you want to start the season," said Man of the Match Jordan Burt. "All the way from Stew [Ceus] all the way up to AJ [Ajeakwa]. From the start of the game we came out with a ton of energy, a ton of quality, and I think it showed in the final score." The Switchbacks return home next Saturday to face Portland Timbers 2. The first 500 fans in attendance will receive a Switchbacks winter beanie courtesy of Weidner Apartment Homes. Fans can also get $1 beers the first 30 minutes after gates open at 5:00 PM. Tickets start at just $12 and are available here.